There have been whispers of this floating around for some time, but today it seems to be confirmed that London’s The Hideout store will shut up shop for good in the near future. The last few years have seen many physical outlets forced to close in the UK, but this one hits extra hard. 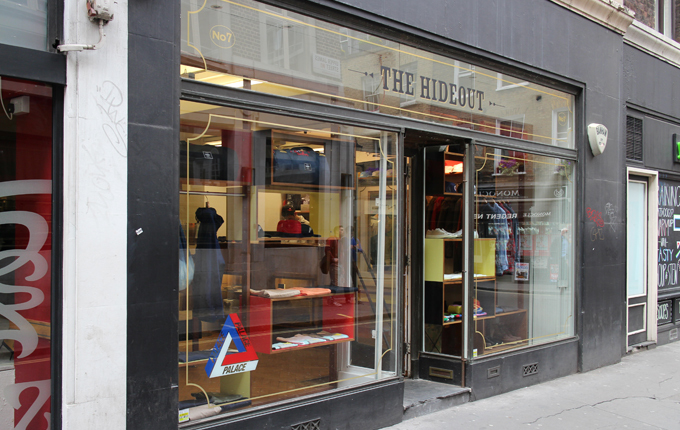 A mainstay on London’s streets with a legacy that stretches as far back as its original ‘Hit and Run’ moniker in 1998, The Hideout has been a home to many of the world’s biggest streetwear brands for over a decade. Supreme, Visvim, Stussy, Neighborhood, WTAPS and more have all been essential parts of the Hideout brand mix over the years, and many will have fond memories of the time spent lining up outside on release day and the purchases made over the years. No official word has been given as to exactly why the store is to close, but I expect that the web-dominated age of streetwear coupled with increasing London rent prices and perhaps even the opening of Supreme’s London Flagship store nearby will all be contributing factors. Despite streetwear being ‘bigger than ever’ in the UK at present, there are now so many more options and avenues for purchases in 2014 and I won’t be surprised if this isn’t the only ‘brick and mortar’ store we say goodbye to this year. We’ll be sad to see it go. See more at The Hideout. Not surprised, unfriendly unhelpful staff don’t exactly make you wanna keep going back. Most of the time they barely acknowledge you, never ask if you need any help, never make recommendations or strike up conversation. Really think they should have one last hurray before they close. They’ve had a number of in-store signings (NERD, Nigo, OF etc) and links to everybody so would make for a great party. This doesn’t hurt as much as Stussy shutting for me, but I feel with all the brands and history it is a bigger deal for sure. Sometimes we have too much at our disposal and this is the result. I always liked the store and the staff. I remember lining up on the first day BBC/Ice Cream released. Just another spot where people used to meet and hang out disappearing. We need to open a streetwear pub maybe? This is a real shame. We used to bump the train in to London just to buy gear from there. I agree with the first comment, and that was part of the style. Once you did get to know everybody in there they were great people and without them the British streetwear landscape would be totally different. It’s a shame to see such an influential and forward thinking shop disappearing and no matter what style of service they provided you could shop there with confidence. @D I think you get that everywhere, Its the whole stigma around being cool and the arrogance that follows. A lot of them grow out of it once they realise they are no better than anyone else. Its a huge shame to see the shop go, as others have said its a place where people could talk about their hobby and interest and meet people to talk. @Bossman75 – Somewhere where people can meet up to talk about streetwear would be good. Release parties are always good to meet new people. Small shops were always good for a quick chat and the community could do with more events. I know TDS did something late last year which i should of gone down to but didn’t have the time. @calmoun: we have more to come this year, glad to have your support! Such a shame, however unsurprising given how unwelcome I have been made to feel each and every time I have entered the shop. Although their product was great, it really is all about the service. I have been shopping elsewhere. Never had an unfriendly / unwelcome experience in this shop, even after I’ve looked at everything and bought nothing – staff clearly has nothing to do with it closing and is irrelevant. Always seemed like normal shop guys to me. Shame to see this go but for the ‘bigger than ever’ uk street wear scene change is probably good. Hipster look down your nose business for minimum wage…pah. I never thought the selection was that good. I don’t think it influenced British street wear, M-Zone, Interstate, American Classics, Fly and Cobra. Went in here plenty of times and sometimes bought nothing, never had any experience of unfriendly or rude staff. Great brand selection, we need at least one brick & mortar shop in London selling a similar range – so annoying to order these brands from afar and having to deal with foreign sizes etc. Personally I shopped there since the very beginning. Yes there was an air of supremecy compared to other street style retailers, but their brand folio was unique in London. Bathing ape, very ape, goodenough, gimme 5, Rollinstock, let it ride…the very best. I put it down to backstreet location,high rent,the Yen, import duty, and of course the internet. Good luck Mr koppelman and the crew. If any of U make a comeback, let’s roll out the red carpet for them! And a word of advice, buy cheaper stock closer to home, I for one would have shopped and spend more often!